Organizers of the 2019 Beijing International Horticultural Exhibition, otherwise known as Beijing Expo 2019, has started preparations of the interior decoration as the event’s site construction comes to an end. The main buildings used as part of the Beijing Expo 2019 will be completed shortly – including the China Pavilion, the International Pavilion, the Horticultural Life Experience Pavilion, the Plant Pavilion, and the Performance Center. To date, 110 national and international organizations have signed up for the expo. 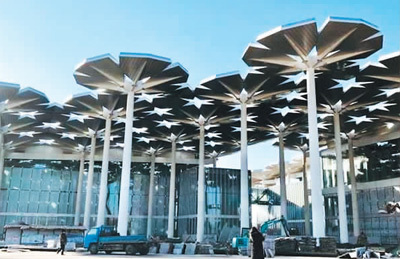 Eighty of them plan to roll out outdoor exhibitions, and 40 outdoor exhibition booths will be constructed, said the Beijing International Horticultural Exhibition Coordination Bureau. In addition, exhibition parks for 31 Chinese provinces, autonomous regions and municipalities, Hong Kong, Macao and Taiwan, and 17 domestic enterprises are also complete. The Xingyan Expressway, which links downtown Beijing and Yanqing district, officially opened to traffic at the beginning of the year, aiming to draw more visitors. About 20,000 parking spots have been created around the Expo area. Except for Xingyan Expressway, local government also constructed another eight roads around the Expo site to ensure smooth transportation. Reports confirmed that the 8-kilometer area around the Expo site would be able to accommodate 22,000 people to dine, and online-booking for nearly 300 home-stays, hotels and B&Bs is now available. The State Council, or China’s cabinet, recently released a work plan for its zero waste city pilot project. According to the document, a zero waste city refers to one with an advanced urban development and management model. Through zero waste, the country aims to promote green lifestyles, minimize the amount of waste produced, strengthen recycling programs and ensure that waste released into the environment is harmless. It is urgent for the country to build zero waste cities due to pollution caused by rapid industrialization and urbanization. Data from China’s National Bureau of Statistics indicated that by May 2018, annual industrial solid waste in the country had reached 3.3 billion tons, and the stock of industrial solid waste had surpassed 60 billion tons, covering more than 2 million hectares. In response to the mounting problem, China unveiled the pilot project to promote urban solid waste management. It is also an important measure to build a beautiful China. The document noted that 10 cities would be selected for the pilot program. By 2020, they are expected to become demonstration models for zero waste cities with a comprehensive management system for waste. Construction of the pilot project will also produce economic and social benefits. Experts said that the output value of recycling and reuse of solid waste in China is expected to reach 7 trillion yuan by 2030, which will create jobs for 40 million people. They added that pilot zero waste cities would also upgrade industrial structures and promote a resource-saving and environmentally friendly consumption model. Herdsmen move their livestock to spring pastures in Zhaosu, a county-level city in northwest China’s Xinjiang Uygur Autonomous Region. 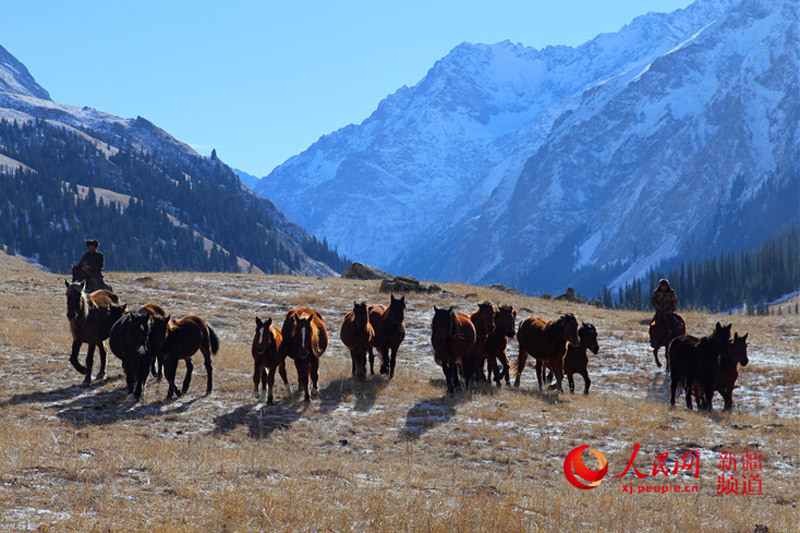 Locals started to move their herds from winter pastures along the valleys in the Tianshan Mountains to spring pastures. An increasing number of cities in China are joining the competition to win more talents by rolling out attractive policies, including large research grants and housing subsidies. 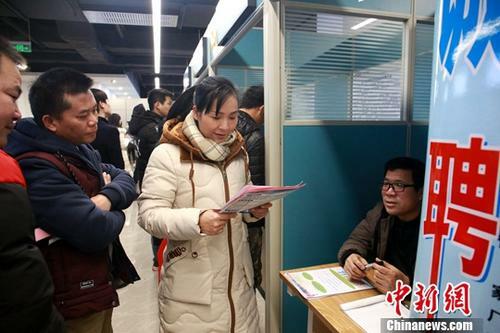 Statistics indicate that by Feb. 18, more than 16 cities in China had introduced preferential policies on household registration to attract talents. Haikou, in south China’s Hainan Province, relaxed restrictions on household registration in both educational background and age. Fresh graduates from colleges and vocational schools and those under 55 years old with a bachelor’s degree can now apply for a household registration in the city. Xi’an, in northwest China’s Shaanxi Province, promised to provide household registration for college students, without restrictions on those with a bachelor’s degree. Guangzhou in south China’s Guangdong Province, a first-tier city, also issued a new round of policies, lifting the age for those with a bachelor’s, master’s and doctor’s degree applying for a household registration in the city to 40, 45 and 50 years old, respectively. Fresh college students can now directly obtain household registrations. Similar campaigns to lure talents have appeared in third- and fourth-tier cities, and even county-level cities. For example, Bozhou in east China’s Anhui Province promised to grant resettlement allowances of up to 800,000 yuan. Moreover, Zhenjiang in east China’s Jiangsu Province confirmed housing subsidies of 150,000 to 200,000 yuan for those holding a master’s or doctorate degree. Ninghai County in east China’s Zhejiang Province also vowed to award research grants of up to 100 million yuan for top-notch teams. Demographic problems in China such as its aging population and low birthrate are behind this competition for talent, said Yang Yansui, director of Tsinghua Center for Employment and Social Security. Chen Qiulin, director of the Institute for Population and Labor Economics at the Chinese Academy of Social Sciences, said that urbanization is another reason. Despite preferential policies to lure talents, the key is to retain these talents, Chen added. To do so, local governments should provide better public services including healthcare, education, and transportation while ensuring economic strength. 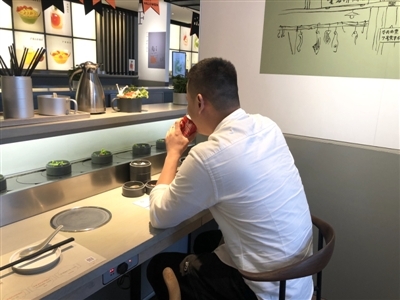 Thanks to China’s large base of single adults, the country’s “single economy” is now enjoying huge growth, and the catering industry is one of the largest beneficiaries. Currently, individual meals are very much in vogue in China, as Chinese singletons chase after a new type of lifestyle. A popular restaurant in Hangzhou, eastern China’s Zhejiang province, once sold 100,000 meals-for-one in just 30 days, with the most bought in one day hitting 6,000. A hotpot brand is also targeting China’s surging single economy. Sheng Xiaohua, the founder of the brand, said that he has already opened four stores exclusively for the single consumer group in Hangzhou, one of which earns up to 10,000 yuan per day. The steady growth of this type of business could be attributed to the rising number of single people in China. A report from Sinolink Securities, a financial institution, showed that China had 220 million single people in 2017, making up 15 percent of the country’s population. The positive attitude of single people has also played a part in driving business growth. Instead of just filling stomachs, they lay greater emphasis on food quality. For this reason, restaurants are working hard to attract more single consumers. In January 2019, Chinese e-commerce giant JD.com released an annual food ranking list of its online supermarket. The index showed that the sales of meals-for-one grew by over 60 percent compared with the same period last year. 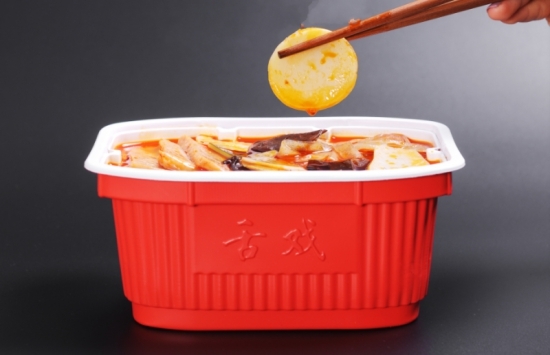 Self-heating hotpots were the best seller. Industry insiders believe that the single economy will upgrade consumption by generating more business sectors. Waste management powered by artificial intelligence (AI) is getting off the ground in China as the country works to build itself into a greener place with more Chinese residents realizing the importance of garbage classification and recycling. 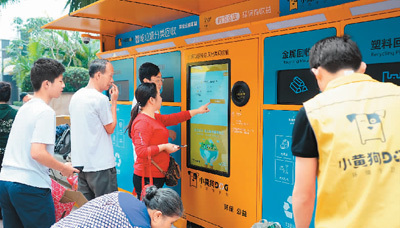 Xiaohuanggou ( which means little yellow dog in English), a company principally engaged in environmental protection, has rolled out more than 10,000 AI-powered waste sorting bins in 33 Chinese cities, gaining over 2.6 million users on its app in less than a year under the support of government policy. The State Council recently issued a plan to build zero-waste cities which promote the “Internet Plus recycling model” to integrate new technologies with garbage sorting. The AI-powered garbage sorting bin could automatically identify waste using cameras or the average density and size of items. It also pays users when they recycle metals, plastic and paper boxes. 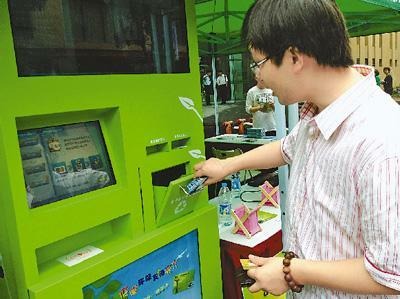 A user surnamed Li, who lives in Beijing, received an environmental protection fund of 0.25 yuan for simply scanning the QR code and putting her broken pan into a smart waste sorting bin. The money is credited to her Xiaohuanggou account and can be cashed once it exceeds 10 yuan. Besides image identification and real-time payment, the smart waste sorting bins also provide services such as big data, cloud computing, and accurate location, which enable users to trace their waste. 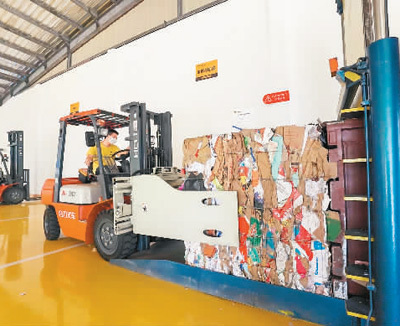 The monitoring system will notify garbage collectors once 80 percent of bin space is used and deliver the waste to the sorting center, where the garbage will be further processed and transferred to factories as renewable resources. Xiaohuanggou plans to establish an online shopping mall and personal credit rating system as well as build industrial parks and chains for garbage classification. Alipay, the Chinese mobile payment giant, has also gone full speed in this race. It has introduced platforms for garbage sorting into over 30,000 communities in 14 cities in the Yangtze River Delta region. Statistics show that China produces about 10 billion tons of solid waste every year. It requires the participation of every Chinese citizen to win the battle against pollution. Li Guoqing, director of the urban and environmental studies department at the Chinese Academy of Social Sciences, said that society needs to raise public awareness for environmental protection instead of just focusing on personal income from recycling. “We will continue recycling through the ‘Internet Plus’ model and draw more people to join us to contribute to China’s waste management,” said Tang Jun, founder of Xiaohuanggou. The Institute of Psychology (IP) of the Chinese Academy of Sciences (CAS) issued its first blue paper on mental health on Feb. 23, revealing that most Chinese citizens have good mental health. The blue paper, titled The Report on National Mental Health Development, will be published every two years. According to Fu Xiaolan, head of the Institute of Psychology, the report was based on major mental health surveys conducted over the last three years, discussing mental health issues, development trends and influencing factors across different groups in China. The report indicated that most Chinese people in urban areas have good mental health. A survey conducted in 2008 suggested that 11 to 15 percent of urban citizens aged between 10 and 100 had relatively poor mental health, and may face mild-medium psychological problems. The report warned that 2 to 3 percent might face medium-serious mental health issues. Another survey from 2012 showed similar findings. However, this particular survey detailed that rural citizens were not as healthy as their urban counterparts. The report showed the enormous demand for mental health services in China. However, mental health resources throughout the country are currently limited. Chen Zhiyan, associate editor-in-chief of the report, suggested that China set up relevant standards, monitor mental health, and include mental health education at school and university level. An emoji of a small drop of blood which signifies menstruation will soon be available across smartphone keyboards, according to the Unicode Consortium, the official body that manages emojis worldwide. Reports confirmed that the emoji was approved together with a further 229 new emojis, and will be rolled out on smartphone keyboards worldwide this spring. Many experts on women’s issues noted that the move was a step toward the end of “period shame”. “Period shame” is not specific to individual countries or regions, but is an issue faced on a global level. Fourteen percent of girls asked said they didn’t know what a period was when they started, and 26 percent didn’t know what to do, according to a survey compiled by Plan International UK, a development and humanitarian organization that advocates children’s rights and equality for girls. Moreover, 48 percent of girls asked felt embarrassed because of menstruation, and 49 percent said they had taken a day off due to dysmenorrheal, the survey revealed. Women in China are no different. 28-year-old Jiang Lin shared her embarrassment with Beijing Youth Daily that she once got her period in class, staining her pants, which forced her to leave the classroom until everyone else had gone home. Although the conversation surrounding periods is changing slowly, many women still consider menstruation a taboo, especially when they are buying sanitary towels and tampons. Emojis are becoming a new language tool and bringing convenience in the age of globalization. Forty-seven percent of women aged between 18 and 34 believe that the blood emoji will make the discussion of their periods easier. The approval was announced on Feb. 6 by Plan International UK, aiming to break the silence, embarrassment, and stigma surrounding menstruation. The blood emoji is a step towards ending period shame, according to Lucy Russell, head of Girls’ Rights and Youth at Plan International UK. She noted that although emojis were not able to ease all negative impacts, they could change the conversation. “The inclusion of an emoji which can express what 800 million women around the world are experiencing every month is a huge step towards normalizing periods and smashing the stigma which surrounds them,” she said. A recent survey of 1,830 young people in China indicated that 66.1 percent of respondents have found themselves guilty of empty talk, becoming sayers rather than doers. The survey was jointly conducted by China Youth Daily and online survey platform Wenjuan.com. Mi Xue is a junior student from Beijing Normal University. She professed herself a “plan maker,” but these plans were rarely finished on time. “I feel the pressure when I’m delayed,” she said, adding that she’s not the only one. “Many of my friends made review plans long before our final exam, but most of them only began to revise the night before the exam,” she noted. 27-year-old Zhang Lanyi, manager of a clothing enterprise, confessed that she was guilty of hollow words in regards to trivial matters. “For instance, I’ve always told my friends and family that I would get rid of my excess weight, but I’ve never worked on it,” she explained. According to the survey, 78.1 percent of the respondents said they were surrounded by this type of duplicity. 68.9 percent of the respondents attributed the phenomenon to inaccurate self-positioning and over-estimation of capabilities, while 58.1 percent believed saying something, and not following through, was instead caused by a failure in scheduling. Xu Guangxing, a psychology professor at East China Normal University, believes that those who have an immature mindset and hypocritical personality are prone to becoming sayers rather than doers. Additionally, those who tend to react impulsively and jump on the bandwagon more often make plans but neglect to finish them, Xu added. The survey showed that 64.3 percent of respondents believed failure in fulfilling plans would impact self-confidence and lower self-esteem, and 60.9 percent said it was not conducive to the formation of healthy habits. “Credibility is becoming more and more important in modern society. Those who have no credibility will not find a place in society, nor their careers and relationships,” said Xu. Not long after the conclusion of this year’s Chinese New Year, ride-sharing has once again come under the spotlight. However, this time it is not because of the industry’s prospering future, but due to public concerns over its development. China’s ride-sharing giant Didi Chuxing lost a staggering 10.9 billion yuan in 2018, and it has been reported that the company plans to lay off about 2,000 people. At the time of press, the company has not yet issued a response. Didi Chuxing’s rivals, CaoCao and Hello-Chuxing, are now trying rid the tag of “car-hailing enterprise” and are both gearing up for another round of industry competition. Subsidies are a must to expand market share in the ride-sharing industry. At the end of last year, Didi Chuxing’s market value stood at nearly $80 billion, accounting for over 60 percent of the Chinese market. It was this massive input in subsidies that won the company its advantage. However, the large subsidies offered by Didi Chuxing has also created huge pressure for the company. Last year, Didi spent a total of 11.3 billion yuan on driver subsidies. Insiders pointed out that the company could have gained an extra 400 million yuan were it not for these subsidies. As a latecomer, CaoCao currently offers bonuses for its drivers, which can also be considered a type of subsidy. 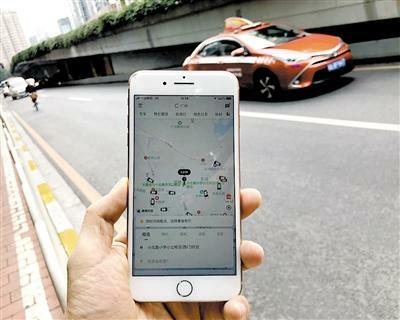 According to drivers with the company, their average monthly income stands at between 8,000 and 12,000 yuan, with bonuses accounting for 15 to 30 percent of that figure. However, unlike Didi Chuxing, CaoCao and Hello-Chuxing are both supported by traditional carmakers, therefore, enjoy natural advantages in vehicle maintenance and operating capital. Additionally, the cars these companies run are electric vehicles, which means they receive new-energy vehicle subsidies directly from the government. For example, each of the electric vehicles with a range of between 200 and 250 kilometers could receive a total of 36,000 yuan from national and local government. Cui Dongshu, general secretary of the China Passenger Car Association, noted that a new round of reform leading to mixed ownership and M&A has started within the auto industry, and the market will play a vital role.